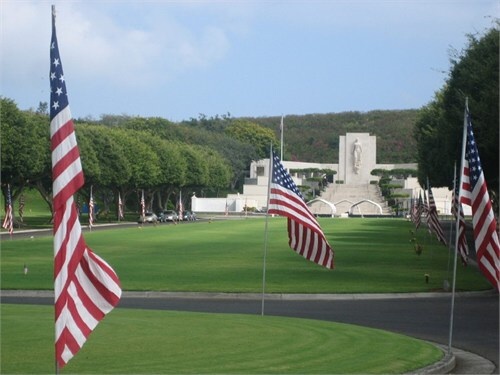 Memorial Day, A Day to remember the men and women who gave their life for their country. 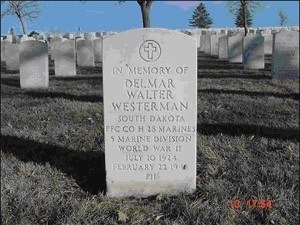 In Memory of Marine Private First Class Delmar Walter Westerman, Chancellor, Turner County, South Dakota, July 10, 1924 – February 22, 1945; Killed in Action on Iwo Jima. Delmar Walter Westerman was born on July 10, 1924. He was the oldest child of Otto and Emma Westerman. He attended rural school in Turner County and graduated from Chancellor High School in 1942. Through the years after Delmar’s death, Otto and Emma, now deceased, often related stories about their son Delmar. His sister Dolores also has frequently told family members many anecdotes of growing up with her brother. It seems that everyone had a nickname, and Delmar’s was Westy. He was a very good athlete, playing on the high school football and basketball teams, and he also became involved in the Golden Gloves boxing program. Scrapbooks kept during his high school years reveal that Westy was an aggressive player. They also indicate that he was fun loving and, as his picture indicates, his good looks made him popular with the girls. Following high school, Delmar began farming with his father. He enlisted in the United States Marine Corps on December 2, 1943, and was sent to San Diego for his boot training. He served with the 3rd Battalion 28th Marines 5th Division. Private Westerman was sent overseas in October of 1944 where his battalion spent several months training on board the ship. In his last letter to his parents, dated February 10, 1945, he stated that he was at sea and expected to be in combat soon. Private Westerman’s first field of combat was at Iwo Jima, where Marine Private First Class Delmar Walter Westerman was wounded on February 21, 1945, while in action fighting for Mount Suribachi. He was immediately evacuated to a hospital ship where he died on February 22. He was given a military burial at sea. 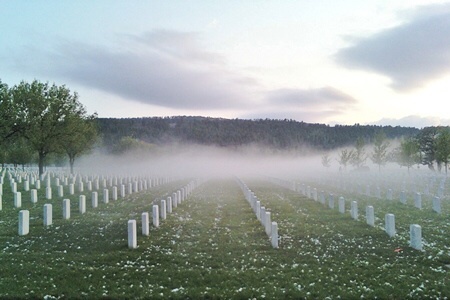 A memorial marker is in place in the Black Hills National Cemetery in Sturgis, South Dakota. A bronze marker has also been placed on the family lot in the Lennox Cemetery, Lennox, SD. Private Westerman’s name is also etched at Punch Bowl Crater, Honolulu, Hawaii. He received the Asiatic Pacific Campaign Medal, the Victory Medal, and the Purple Heart, all posthumously. Delmar Walter Westerman was a great Marine, who died fighting for his country. He will always be remembered as a brave man who sacrificed his life for the United States. This entry was respectfully submitted by Lane Mellegaard, 11th Grade, Parker High School, Parker, South Dakota, April 30, 2002. Information for this entry was provided by Darrel and Karen Westerman. Darrel is Delmar’s youngest brother, who was five when Delmar gave his life for his country. Delmar Westerman was a First Cousin I never knew. He died years before my birth. The above is a collection of information I found on the web, most NOT written by me. When I was young I paid my respects at Black Hills National Cemetery, Sturgis, SD with my parents and my Aunt & Uncle; Otto and Emma. Private Westerman’s first field of combat was at Iwo Jima. Marine Private First Class Delmar Walter Westerman was wounded on February 21, 1945, while in action fighting for Mount Suribachi. He was immediately evacuated to a Naval Hospital Ship where he died on February 22. He was given a Military Burial at sea. He died one day before the flag raising at Iwo Jima. He received the Asiatic Pacific Campaign Medal, the Victory Medal, and the Purple Heart, all posthumously. Delmar Walter Westerman was a great Marine, who died fighting for his country. He will always be remembered as a brave man who sacrificed his life for the United States. Beatutifully written CarolMaeWY! Thank you for sharing it with us. I do believe in family stories. This is how they stay alive. Remember to take care of yourself. Beautiful remembrance of a fine warrior who stepped up and paid the great price on behalf of our nation. I am grateful for his service and sacrifice. How wonderful that he lives on in the memories of family and friends. This is a wonderful post, a very good read. Thank you. Out of thirty-three cousins, he is one of two who died before I was born. My father was fighting WWII in Europe. Thank you for sharing, Carol! Several years ago, I had the opportunity to visit some of the largest WWII cemeteries in Europe. The saddest graves to see were the white crosses without names. Thanks for documenting this man’s life! Thank you for stopping by. My Dad fought in Europe during WWII. (He was the youngest of eight children. Not much older than my cousin.) Thank you for paying your respects at the cemetery.